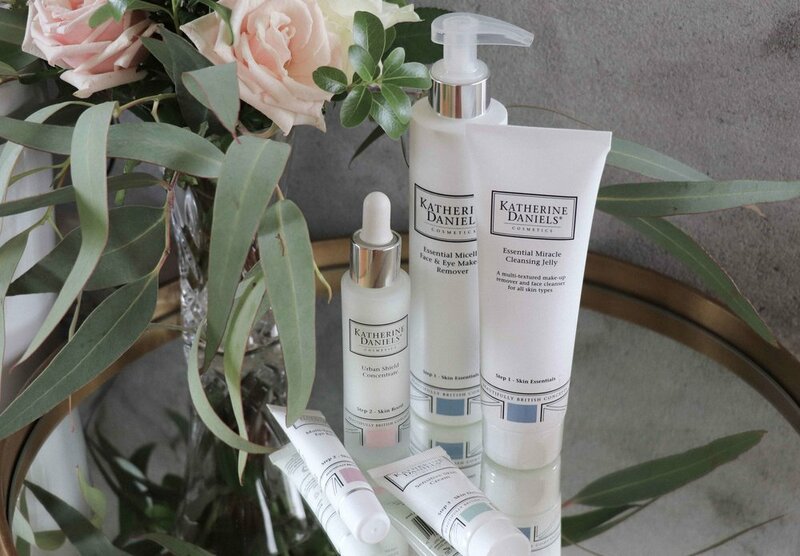 Katherine Daniels is a British professional skincare brand that combines the best Mother Nature has to offer with the latest biotechnology. Editor Trudi Brewer meets the founders and learns how to get better-looking skin for life. When Donna Tait and Kirsti Shuba launched Katherine Daniels skincare ten years ago, they knew they were up against some stiff competition. Made with natural ingredients with a scientific edge, this UK brand is on the rise here in New Zealand. Here’s why these beauty trailblazers are at the top of their game. Editor Trudi Brewer with Donna Tait (left) and Kirsti Shuba (right). "Our dream was to create results-driven products and salon treatments with a luxurious touch; we wanted to give ‘wow’ results to everyone." How and why did the Katherine Daniels (KD) brand begin? Kirsti Shuba (KS): Our story began when we met. I am a skincare expert and Donna is a top facialist. Combined we have 65 years’ experience; there’s not a lot we don’t know about skincare. For decades we have helped thousands of people to look and feel fabulous. Our dream was to create results-driven products and salon treatments with a luxurious touch; we wanted to give ‘wow’ results to everyone. We joined forces with some of the world’s best cosmetic scientists and Katherine Daniels Cosmetics was born. With our products, you can say goodbye to long, complicated skincare routines and hello to a simple four-step prescription process and beautiful skin. Donna Tait (DT): After some market research, we realised we didn't want an owner-centric name for our brand, but we did want to have a family connection and a name that was quintessentially British. Katherine and Daniel are the names of Kirsti’s children and my godchildren. The name came together during an early morning feed when Daniel was just a few weeks old. Some would say it was an epiphany. What's the philosophy behind the formulation of the products? KS: We knew we had competition in the professional market, going head to head with some heritage brands that have been established for decades. We wanted to de-mystify skincare and create a range of products to treat the underlying causes of common problems within the skin, not just the symptoms you see on the surface. Our products use the latest technology to improve how the skin functions, making it healthier and appear more youthful. This natural skincare brand is sold in spas and beauty therapy clinics and offers luxurious hands-on skin treatments, as well as active home care products. Were there any no-nos when it came to choosing ingredients? DT: We wanted to be cruelty-free and as free from as many nasties as possible. Our range contains no parabens, mineral oils, SLS (foaming agent sodium lauryl sulphate), or MIT (the preservative methylisothiazolinone). How does the KD range help to protect skin from external aggressors like the environment? KS: Our philosophy is to treat skin type and conditions that occur due to lifestyle, environment and climate. Our products address dehydration, sensitivity and the process of skin ageing. Our formulations contain antioxidants, hyaluronic acid, seaweed and algae extracts as well as sea water. Sensitive skin is on the rise, what should women do when suffering from this skin condition? DT: The cause of sensitive skin should be treated rather than the symptoms. KD is an advanced skincare range and can do exactly that. By treating the underlying cause, we make skin work harder and improve itself. Most skincare brands treat the symptoms, which is a bit like sticking a band-aid over the problem rather than working to fix it. 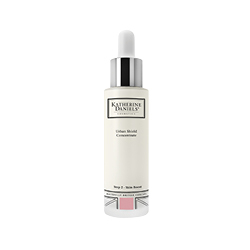 Katherine Daniels Urban Shield Concentrate, $84. Katherine Daniels Essential Face & Eye Makeup Remover, $45. Katherine Daniels Essential Miracle Cleansing Jelly, $44. Katherine Daniels Multi-Tasking Eye Balm, $78 and Katherine Daniels travel size Sensitive Skin Cream, $40. KD is not certified organic, how natural is the range? KS: Our products contain the best mother nature has to offer from the land and sea, so the majority of our ingredients are natural. We combine these ingredients with the latest biotechnology to create active natural skincare. Is it this combination of nature and technology that helps to address the signs of ageing? DT: Absolutely, 100 percent yes. Our products treat the signs of ageing by making the skin work harder for itself. Specific products address the skin's cellular energy and cellular communication. By stimulating these two functions, we kick-start the GAG synthesis (the natural moisturising factors) of the skin. This means your skin will begin to produce more collagen, elastin and hyaluronic acid. By doing this, other ingredients such as antioxidants will also work more efficiently. Our products create a better-looking skin for life. Why did you choose the clinic and spa business to promote and sell the brand rather than retail? KS: You will always get the best results if you combine salon treatments with targeted at-home products. To be able to offer this we needed to be available in the professional market. Our home care products contain the same formulations used in our salon treatments, so our clients can use salon-strength products on a daily basis. Who designs the treatment protocol that complements the products? DT: We both do. We use tried and tested techniques and a passion that comes from the heart. Our treatments combine luxurious, five-star methods that deliver visible results. These are the values that set Katherine Daniels apart from other skincare brands. Tell us about your new Essential Miracle Cleansing Jelly, where did the idea come from? KS: The jelly is our interpretation of a cleansing balm. It is a new-generation cleanser that transforms from jelly to oil, then emulsifies into milk to efficiently remove long-wearing, waterproof make-up. It also makes a fabulously soothing after-sun mask, and its airless packaging makes it ideal for travel. The great thing about KD being a family owned brand, rather than part of a large corporation, is that we can offer new skincare innovations like this quickly. Editor Trudi Brewer's pics from the range include: Katherine Daniels Essential Miracle Cleansing Jelly, $44. Katherine Daniels Body Essentials Nourishing Hydrating Balm, $65. Katherine Daniels Urban Shield Concentrate, $84. Katherine Daniels Multi-Tasking Eye Balm, $78. What are you most proud of to date? DT: Each time one of our client's posts a before and after picture, comments on one of our treatments, or shares a product review, we still both feel like proud mums. We pinch ourselves every time a new salon or spa opens with KD products. What's next for the KD brand? KS: More innovation – we are planning the launch of our DNA Daily Defence SPF30 sunscreen. It is a pocket-sized product which protects skin from UVA and UVB, blue light (from technology) and pollution. It protects your cells' DNA and repairs any damage 50 times faster than your body can. The formula is a beautifully light, clear veil, which leaves no white or oily residue and it will not block the skin and cause blemishes. It is fragrance-free and fabulous on even the most sensitive skin. We're also finalising our Age Defence cream for dehydrated skin. This treatment cream contains the latest in turbo hydrating agents alongside well-known hydrating ingredients, such as hyaluronic acid and active ingredients like flax seed oil. Finally, look out for our Total Skin Repair Concentrate SOS in-salon treatment, will be offered with our professional therapies as well as a home care product. We are also working on our first skin peeling treatment, which is set to launch in salons and spas early in 2019.